A means of communicating with spacecraft from the surface of the Earth. A very early description of a means to communicate with a spacecraft from the surface of the Earth. The sun had apparently set behind the moon, and they were eclipsed. The stars shone with the utmost splendour against the dead-black sky, and the earth appeared as a large crescent, still considerably larger than the satellite to which they were accustomed. Exactly at midnight a faint phosphorescent light, like that of a glow-worm, appeared in the region of Greenland on the planet they had left. It gradually increased its strength till it shone like a long white beam projected from a lighthouse, and in this they beheld the work of the greatest search-light ever made by man, receiving for a few moments all the electricity generated by the available dynamos at Niagara and the Bay of Fundy, the steam engines, and other sources of power in the northern hemisphere. The beam lasted with growing intensity for one minute; it then spelled out with clean-cut intervals, according to the Cable Code: "23° no' 6". The southern hemisphere pumps are now raising and storing water at full blast. We have already begun to lower the Arctic Ocean." On receiving this last earthly message, the travellers sprang to their searchlight, and, using its full power, telegraphed back the following: "Many thanks to you for good news about earth, and to Secretary Deepwaters for lending us the navy. Result of work most glorious. Remember us to everybody. Shadow's edge approaching." This was read by the men in the great observatories, who evidently telephoned to the arctic Signal Light immediately, for it flashed back: "Got your message perfectly. Wish you greatest luck. The T. A. S. Co. has decked the Callisto's pedestal with flowers, and has ordered a tablet set up on the site to commemorate your celestial journey." 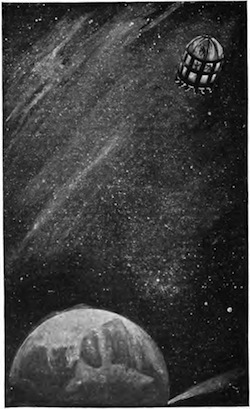 Compare to this method of communicating with extraterrestrials from Jule Verne's From the Earth to the Moon (1867).